I was getting up to date on WhyDev – an excellent forum for development discussion online – and came across the post ‘8 things I wish I knew before I started in development’ by Rachel Kurzyp. While it’s great to be an expert in a specific field it’s just as important to be a generalist. You need to be comfortable and able to take on general tasks when required such as basic admin, report writing and supply distribution. Humanitarian work is on-going, though there are periods of downtime, but you may be required to do dual roles in smaller programmes. You could also find yourself without work for short periods due to programme closures or waiting on grant approvals. This is when you can draw upon your past life’s skills and gain work in other departments or roles outside of the development sector. I think this is sound advice. Trends and fashions change the prevailing winds in development at least as much as in any other sector. As nurses or teachers will tell you, any industry that politicians have direct and immediate access to is liable to get shaken up, oh, every four years or so. It would, therefore, be cruel to advise any wannabe development types (like myself) to specialise too soon. Besides, there are a lot of ‘basic’ skills and experiences you have to get under your belt before you can think about hunkering down into a speciality and living up to that possibly dubious ‘expert’ tag you’re itching to add to your Twitter bio. 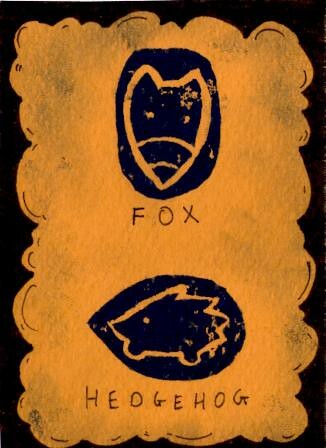 There is a line amongst the fragments of the Greek Poet Archilochus which says, “The fox knows many things, but the hedgehog knows one big thing”… Taken figuratively, the words can be made to yield a sense in which they mark one of the deepest differences which divide writer and thinkers and, it may be, human beings in general. It would seem to me that development workers are foxes, or, at least, better off being foxes. These are not categorisations intended to be taken as gospel truth, of course. Berlin goes on to point out that these lines could be, very specifically, about actual hedgehogs and foxes – i.e. hedgehogs know one way to stop a fox from eating them and it is a successful one despite the different techniques of the fox. But, as a thought experiment, it is a nice way to start thinking about colleagues or thinkers or professors or writers or, if you’re feeling particularly brave, even yourself. It is especially interesting to examine the industry in light of this artificial definition. Is it useful for development workers to be foxes? I agree with the WhyDev post in that it makes those workers more employable and probably easier to work with. But is that missing the bigger picture? Perhaps the generalist outlook of development is misguided. Perhaps it perpetuates a system that seems to be addicted to reinvention, to new bold narratives of change and progress. Such things fill the blogosphere with laments and generally the big guys get pointed out as culprits – donors, governments, the military. While the notion of the development worker as a fox opens up excellent opportunities in punning blog post headlines, this could well be scant reward for collusion in ineptitude. Alternatively, you could argue that the hedgehog is a disastrous profile for a development worker. It suggests inflexibility which makes team based projects a strained experience at best. Is there anyway a development project, let alone entire organisation, would work without an emphasis on teamwork? Sure, the fox might go low on details but at least it will try to innovate and attempt different options – the notion of listening to stakeholders at beneficiary and benefactor level seems too sound to throw away to me. That might be worth defending the vulpine status quo on its own. Once again, the model is something of a nonsense but, play along. Think about it in a context close to you and see if it doesn’t stick in your mind. It did for me. If you have thoughts, please post them below so readers can access more coherent thoughts than my own. If it doesn’t stick with you then… well, that’s just typical fox behaviour isn’t it? This entry was posted in Analysis, Innovation, International Development and tagged foxes, hedgehogs, Isaiah Berlin, Whydev. Bookmark the permalink. What Brendan said. Being a specialist will get you your first two, maybe three jobs. Assuming you do them well, and assuming you don’t want to live in a cloistered think tank box in London, you’ll find the next rung up on the career ladder involves bringing all that book learnin’ expertise plus being in charge of 30 staff, 6 vehicles, and a million dollars of procurement and assets. Goodbye specialism, hope you picked up some people management, project management, and financial management skills along the way. Great topic. It has been in my head for a while. And now that I read your post it seems that we all face similar decision pathways. I agree with Brendan, though I’d add that best for me is to embody a multi-disciplinary worker. The best professors & specialists I’ve met in my development life were specialists in more than one field + reading far & wide on general issues. It struck me their better understanding of diverse and complex issues as well as a capacity to analyse beyond one discipline. And particularly their respect for other people’s knowledge and the humility to accept all that you don’t know about when you are working in any aid/development project. I will be short and concise in my opinion. I think you will make a better development worker if you are a generalist. But, you are more likely to get a job if you are a specialist. So, become a specialist (pursue degrees in technical areas of expertise: agriculture, management, education, health, etc.) but make sure to read widely when you can, and seek and engage in networks across different fields and disciplines. i.e have friends and colleagues who are bankers, economists, communication studs, etc. Train as a specialist, but embody a generalist (trademark). Open Government: What does it really mean?